Time both flies and stands still when you’re looking forward to something. I have a holiday booked and I’m happy to say it’s now imminent. Lots to sort out before we depart though so my desk is littered with list upon list. When we do have the opportunity to travel we endeavour to explore somewhere completly new to us. Sri Lanka has always been on my bucket list, with irresistible food, (very important to me!) It’s an island of national parks, timeless ruins, tea plantations, oodles of elephants and endless beaches, what’s not to like! 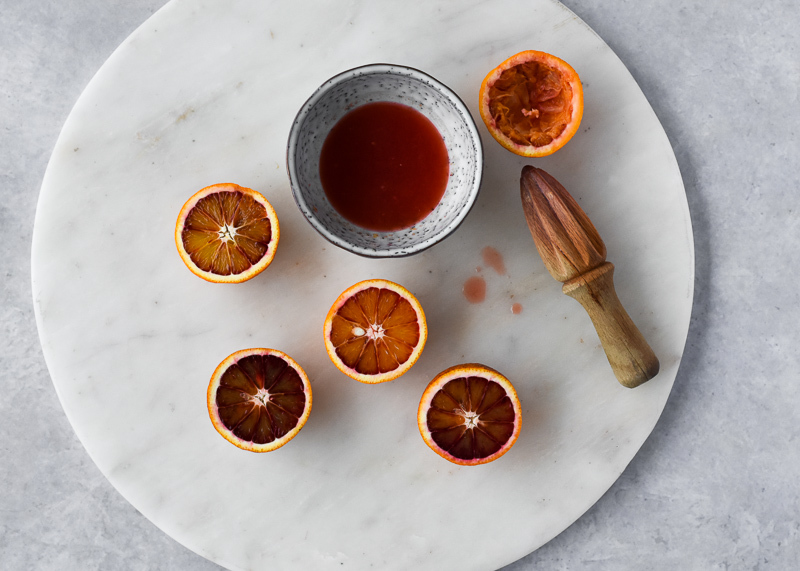 Now that the citrus season is in full swing I’ve been testing all sorts of recipes using blood oranges, an absolute favourite of mine along with forced rhubarb. 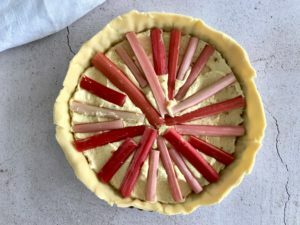 These two ingredients work so well together although I find it so hard to believe that rhubarb is a vegetable! 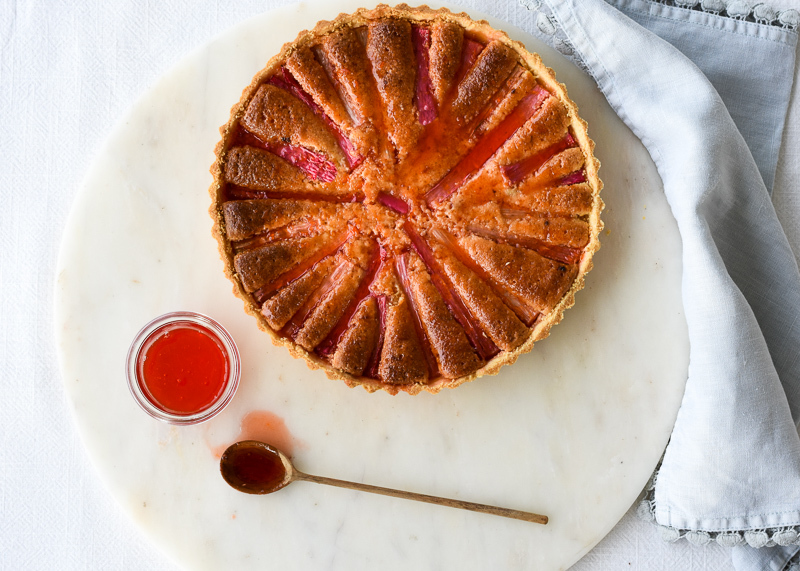 The gorgeous crimson pink fools you into thinking it’s destined for a tart or crumble. Have you tried it in savoury dishes? It works very well with pork and fennel and another suggestion is lightly pickled with seared mackerel, also delicious. 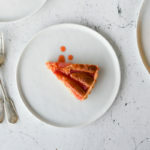 I’m going with a sweet tart today, a buttery pastry case filled with an almond frangipane, tender pink rhubarb stalks and coated with a blood orange syrup. You can prepare this ahead and warm through when needed. Begin by making the pastry, put the flour, sugar and butter into a food processor. Pulse two or three times until it resembles breadcrumbs. Add the egg yolk and water and pulse until the pastry just comes together. Turn out onto a lightly floured surface and bring the dough together into a ball. Wrap and place in the fridge for 20 minutes. In a food processor or using an electric whisk beat the butter and sugar until light and fluffy and pale in colour. Whisk the eggs and egg yolk in a separate bowl. Gradually add the egg mixture to the butter and sugar, little by little, scraping down the sides of the bowl as you go. Fold in the ground almond and flour and add the zest of the orange. Remove the pastry from the fridge and roll out onto a lightly floured surface, have a 24cm loose bottomed tin ready and line it carefully with the pastry. Leave the pastry hanging over the side as you can trim this once it is cooked. 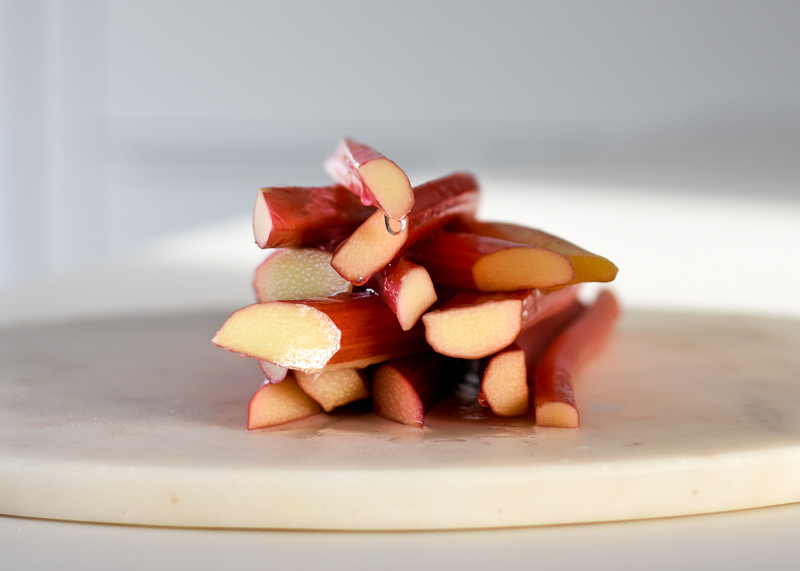 Carefully arrange the rhubarb on top of the frangipane. Preheat oven to 175C Fan and bake for 45 minutes, you may need to cover the tart with foil in the last 10-15 minutes of the cooking time. Once cooked remove from the oven and with a microplane shave off the excess pastry. While the tart is baking make the orange syrup. Place the juice and sugar in a saucepan, on a low heat dissolve the sugar in the juice. Once dissolved turn the heat up and simmer until it has reduced by two thirds. When the tart is baked spoon some of the syrup on to the tart, you may need the help of a pastry brush to distribute the syrup. 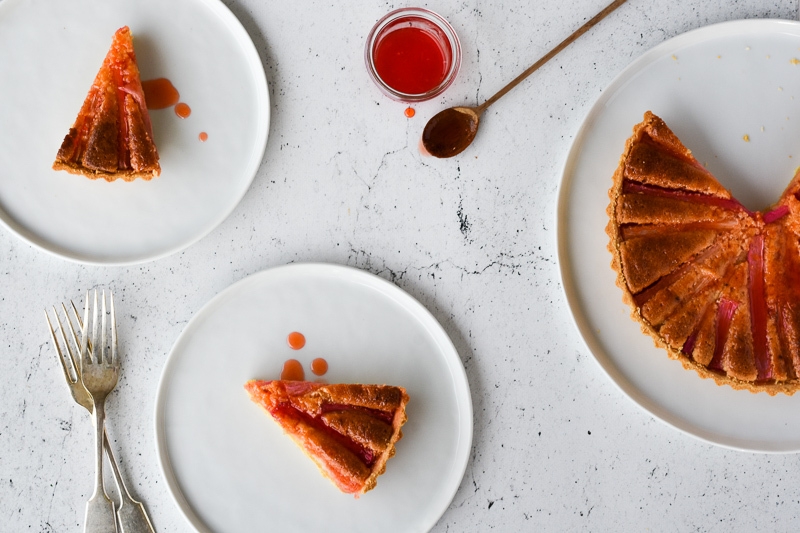 Serve any leftover syrup with the tart and a jug of cream. * For a savoury twist add a few sprigs of fresh rosemary to the frangipane.